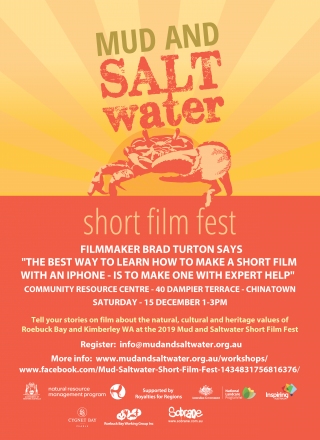 Inspired to make a short film with an iPhone or iPad? 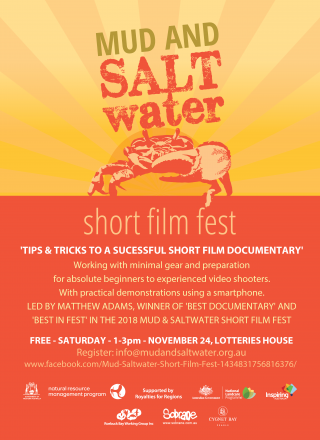 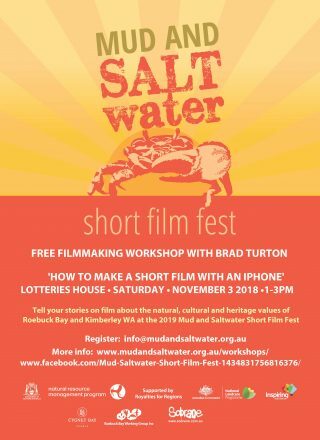 Well here’s your opportunity… Brad Turton will lead a FREE iPhone filmmaking workshop Saturday afternoon 1-3pm (Nov 3, 2018) at Lotteries House (room out back). Georgie Barnes will help too. Four films entered in the 2018 Mud and Saltwater Short Film Fest were shot on iPhones . 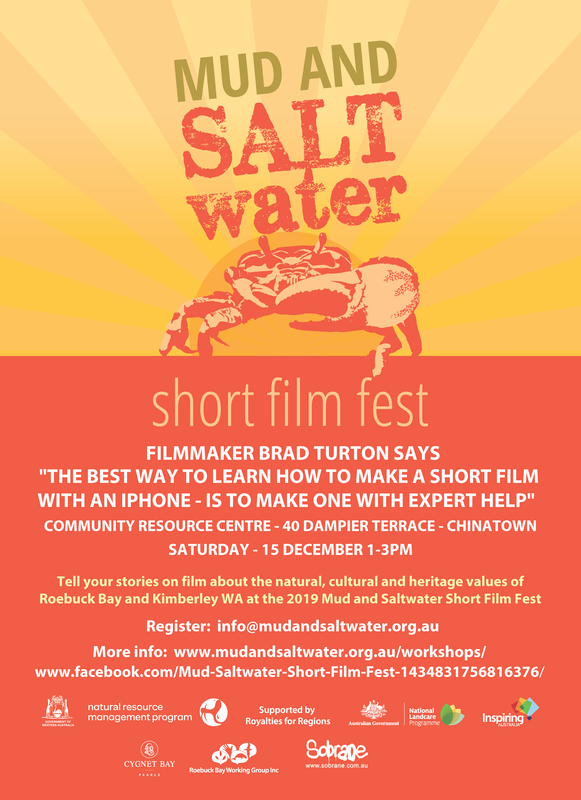 Register here info@mudandsaltwater.org.au and if coming, please download the free iMovie App (you should already have it on your phone), be sure your IOS is up to current with updates, and bring your iPhone and or iPad. 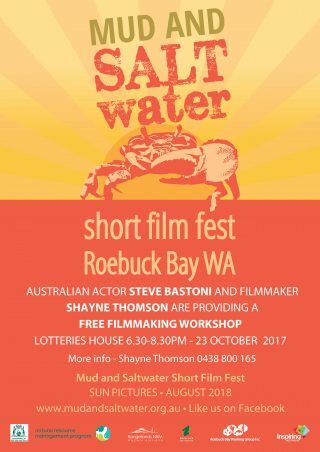 Great news filmmakers, there are two filmmaking workshops on Monday 23rd October lead by Australian actor Steve Bastoni and filmmaker Shayne Thomson. Register your interest now. 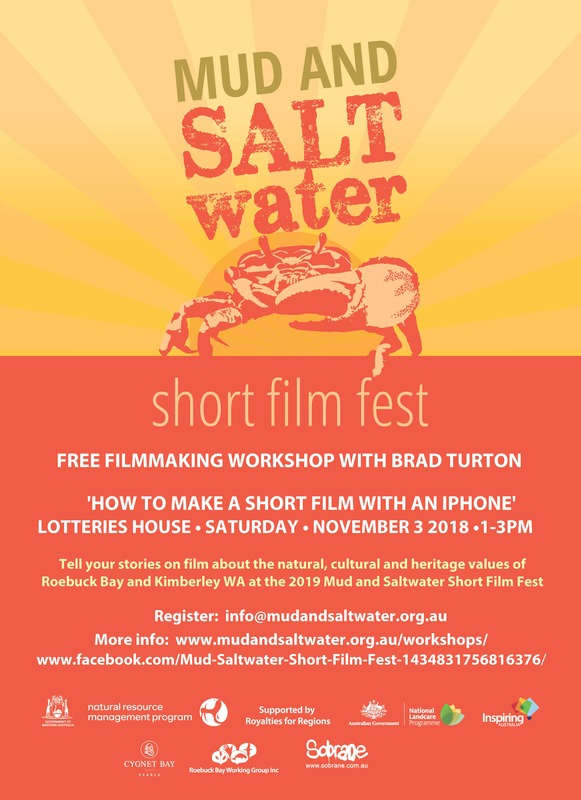 The second filmmaking workshop on Monday 23 Oct is from 6.30pm – 8.30pm, Lotteries House, Steve Bastoni will help with scripting, acting and directing, and Shayne Thomson with camera technique and techie stuff. Both great workshops and we look forward to seeing you there. 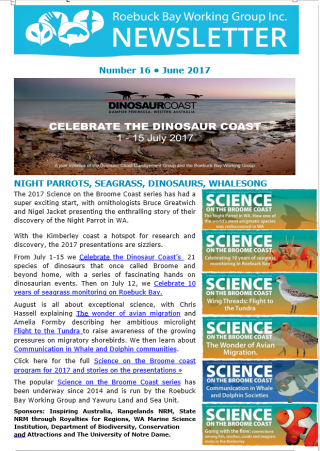 Kimberley coast, and was sponsored by Cygnet Bay Pearls, Sobrane Simcock, State NRM through Royalties for Regions, Inspiring Australia and Rangelands NRM through the National Landcare Program. 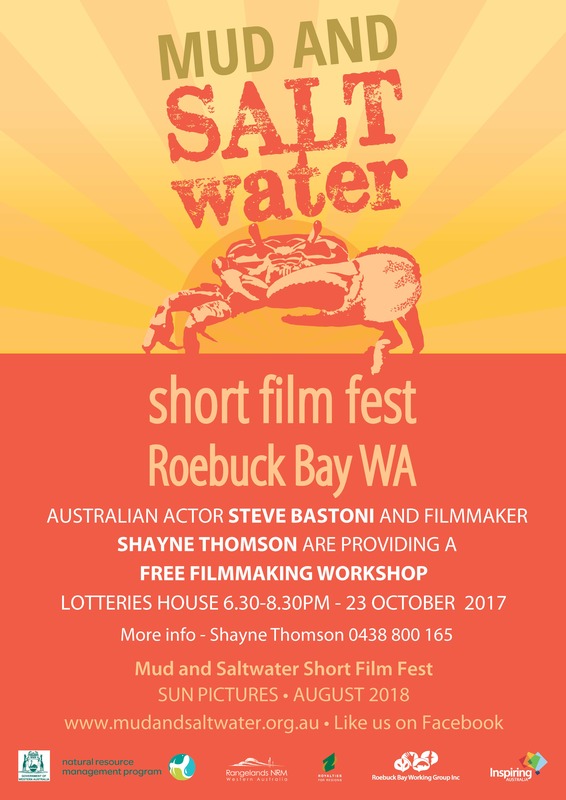 Australian actor Steve Bastoni provided filmmaking / acting workshops with Film Fest Co-Director Shayne Thomson which paid off, with lots of entries from emerging filmmakers. 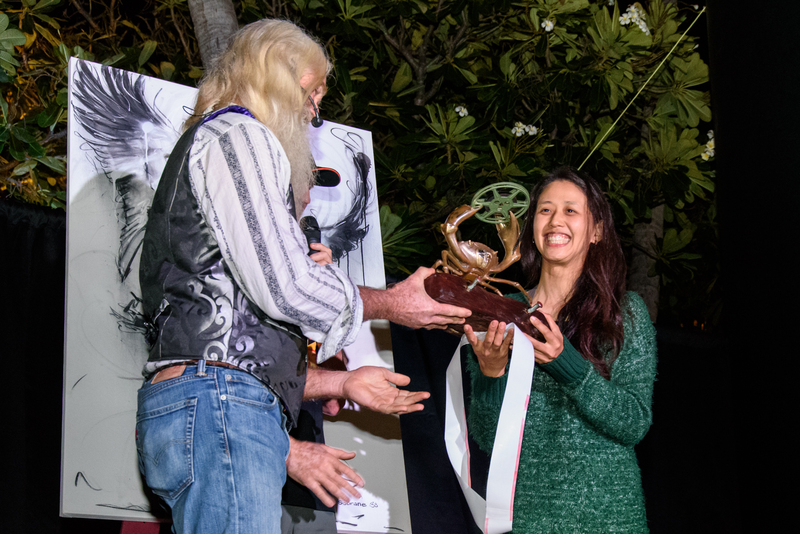 MC Greg Quicke, aka #spacegandalf after appearances on Stargazing Live was a drawcard, along with Sobrane Simcock who painted a dancing brolga which she donated for silent auction, raising $1800 for the 2019 Mud and Saltwater Short Film Fest. Check out the Mud and Saltwater Short Film Fest website for details on the next Film Fest. 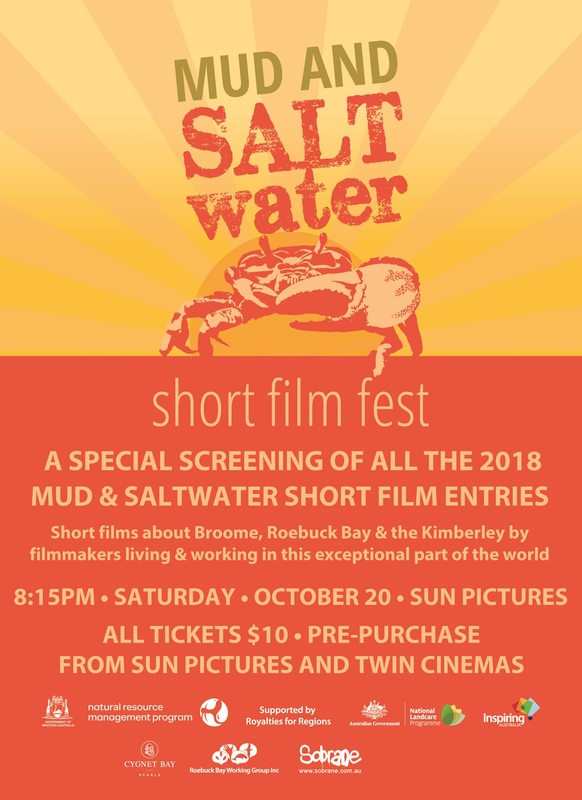 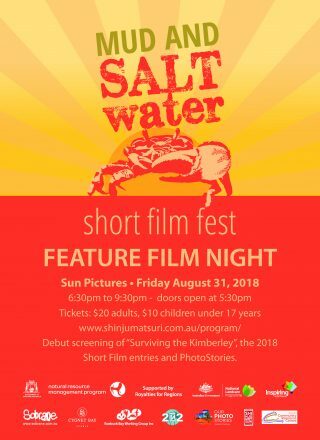 The MUD AND SALTwater SHORT FILM FEST is an initiative of the Roebuck Bay Working Group, and we thank the major funders: Cygnet Bay Pearls, State NRM though Royalties for Regions, Inspiring Australia and Rangelands NRM through the National Landcare Program. 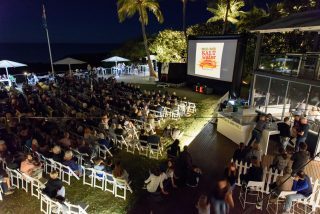 We also thanks the businesses and Not For Profit organisations who donated prizes and in kind support: Greg Quicke from Astro Tours, Betta Home Living, BK Signs, Broome Bird Observatory, Broome Broome Car Hire, Broome Whale Watching, Diverse Water Sports, Finn Films, Good Cartel, Harvey Norman, National Science Week, Pindan Printing, Sobrane Simcock, Sundowner Camel Tours , The Mangrove Hotel and Zanders.